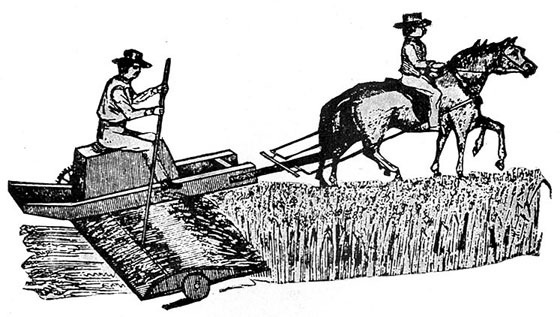 For centuries wheat was cut by a scythe, then the fallen sheaths gathered by hand as seen in the following sketch of the Hussey reaper and the mowers using scythes (on right) in England. Click images to enlarge. 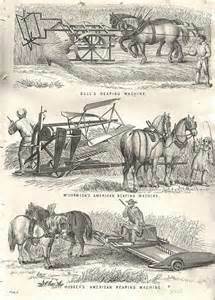 Fascinating films of harvesting by hand and by horse drawn machines: English harvest 1938 using scythe then 'modern', all the manual labor, ending with a huge pile covered with last year's hay as roof; and A Day in the Hayfields 1904 showing various early horse powered equipment. 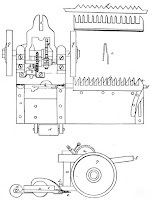 Hussey was born in Maine into a Quaker family, went to sea, then went to Baltimore and worked on his plans in the factory of Richard B. Chenoweth. 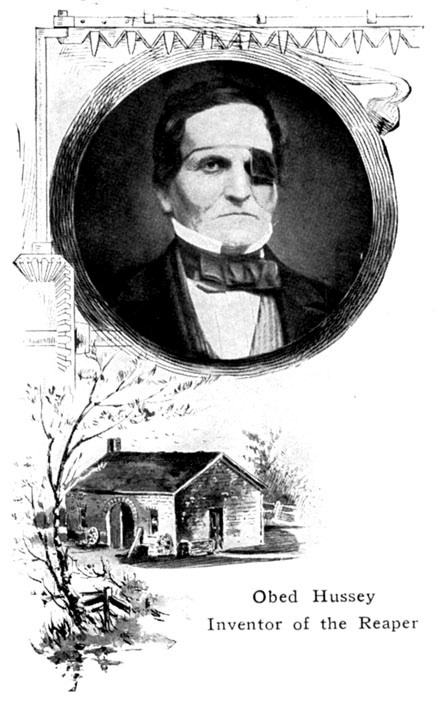 By 1833 he was at Cincinnati, Ohio where his reaper was successfully tested during that years harvest. 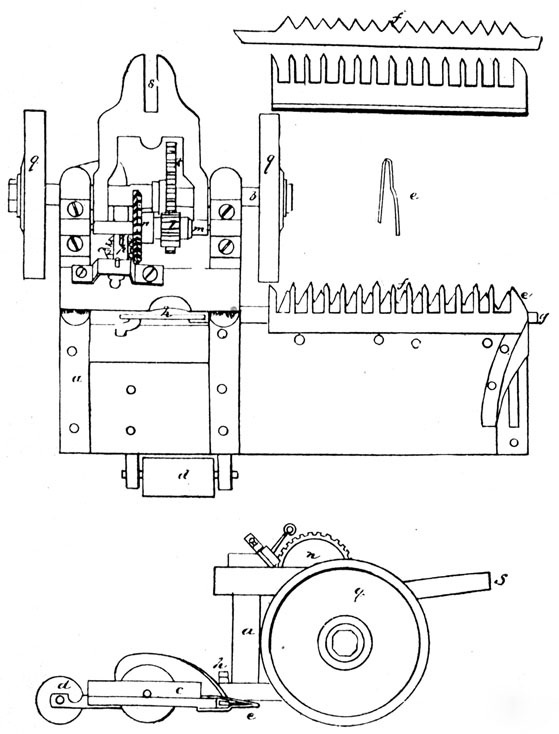 He patented his design, with the very novel and efficient cutting 'teeth'; and "Hussey's Grain Cutter" was written up in the Mechanics' Magazine, and Register of Inventions and Improvements, April 1834 title page. 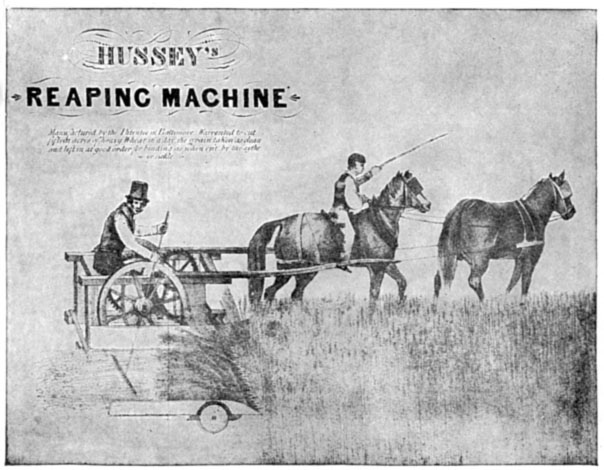 McCormick patented his very different designed reaper later than Hussey, and for a couple decades his did not perform or sell well. 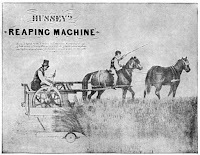 And yet he kept petitioning and appealing judgements for Hussey at the patent office to be declared the first, until the final decree that Hussey's 'teeth' were integral to all following reapers... in 1861, a year after Hussey died. Hay in Art. An interesting site with tons of images HERE ‘essays’ such as ‘Roles in the hay (work)’ – women at work with rakes in 60+ paintings.